ACT - Advertising/Communications Times | Philadelphia's longest established B2B newspaper. The longest established business-to-business monthly journal for company owners and executives in Philadelphia, Eastern Pennsylvania, New Jersey & Delaware… Mailed direct to buyers of business services & products. Marking 40 years of service. 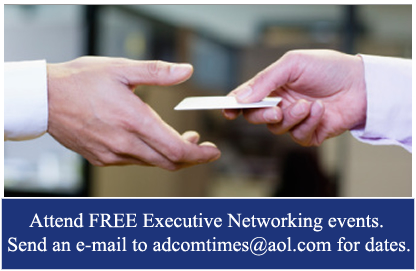 Executive Networking Card Exchanges. Sponsorships available. Joe Ball, Philadelphia-area publisher, advertising agency owner and radio show producer, has been named chairman of the U.S. International Film & Video Festival judges committee in the Business-to-Business category. The subject materials are videos submitted by businesses, production firms and advertising agencies from throughout the U.S. and internationally. Ball continues to lead American Advertising Services, 29 Bala Ave., Ste. 114, Bala Cynwyd, PA 19004, a firm he founded 55 years ago. “LIKE” US ON FACEBOOK! American Advertising/ACT, Inc. If you would like a representative to discuss how we can help you, please fill out the form below or call us at 484.562.0063. © 2011 Advertising/Communications Times. All rights reserved.